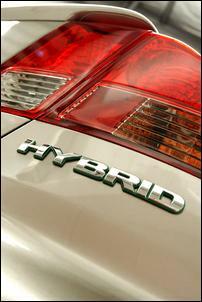 The Insight was Honda’s first foray into locally-delivered hybrid cars. Using a very aerodynamic two-door body, the all-aluminium car could achieve simply phenomenal fuel economy. When we drove the car 3500 kilometres it averaged just 3.6 litres/100 km – arguably the best fuel economy of any road car in the world. 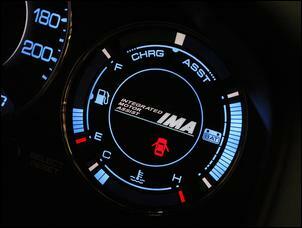 (See Honda Insight.) However, under the Insight’s hatch there was little luggage space – instead you got a big battery box. And at nearly $48,900, the Honda was just way too expensive – less than 50 examples found local homes. Fast forward 3 years and now Honda has released the Civic Hybrid. And if the Insight screamed ‘radical’, the Civic simply murmurs ‘conventional’. Other than the Hybrid badge, it’s impossible to tell from the exterior that this Civic boasts petrol-electric technology. Even after you step inside, there’s not a lot to notice – just charge/discharge and battery level displays incorporated into the instrument cluster. And yes, even after you drive the car, you’re more likely to notice the steplessly variable transmission than realise the innovation in the engine bay. At $29,990, the Hybrid Civic is only 10 per cent more expensive than the GLi auto trans Civic. For the extra money you get a unique mechanical configuration that uses a 1339cc SOHC 8-valve VTEC engine. The long-stroke design develops 69kW at 5700 rpm and 119Nm at 3300 rpm. 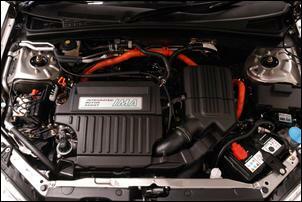 The electric motor consists of a thin design sandwiched between the transmission and the engine. It develops a maximum power of 10kW – however, as in all hybrids, it’s the torque available from the electric motor which is more important than the peak power - the combined petrol-electric torque is an impressive 146Nm at 2000 rpm. Electrical power is provided by a 144-volt battery pack that lives behind the rear seat. Compared with a Toyota Prius, the Honda system is a much softer hybrid. The electric motor is lower in power and as a result, the petrol engine does most of the work. In fact, the electric motor is used only to assist the petrol engine – the car cannot drive on electric power alone. The electric motor is also used to start the petrol engine, and with a 10kW starter motor, the petrol engine comes to life very quickly indeed! This allows the system to switch off the petrol engine when the car has been braked to a halt, for example at a red traffic light. When the driver lifts their foot from the brake pedal, the petrol engine automatically restarts. However, the petrol engine doesn’t turn off nearly as often as in the Prius (or as often as we remember it occurring in the Insight) and so the resulting reduction in fuel consumption is more limited. The electric motor assists the petrol engine when accelerating or climbing hills. This assistance is more noticeable at low speeds, where the electric motor feels rather like a small supercharger. The battery is recharged primarily through regenerative braking – rather than wasting power as heat in the brakes, the motor becomes a generator and pushes charge back into the battery whenever you slow. However, if the battery level gets too low (eg because you’ve been climbing a steep hill) the petrol engine is automatically used to charge the battery. From an owner’s perspective, all this can go unnoticed – just put normal unleaded in the tank and drive. In the manner of all hybrids, the 0-100 km/h time is slower than the actual on-road performance feels. The Honda gets to 100 km/h in about 14 seconds but in its throttle response and ability to dart off the line, behaves more like a 12-second car. Top-end power from the VTEC engine is also quite adequate. Lifting off the accelerator enables regenerative braking. This occurs even before the driver manually brakes and results in the car slowing more rapidly than normal. However, again it’s been implemented very well and the only driver familiarity needed is to avoid backing right off when you want to slow only a little. The integration of the regen braking and the hydraulic braking is excellent; the brake pedal is progressive and has good feel. So with all this technology at your disposal, what’s the fuel economy like? Honda claims a combined cycle test economy of 5.2 litres/100 km but we averaged worse than that at 6.3 litres/100. In fact, our figure also matched the economy gained by this car over its lifetime – this number can be also displayed on the dash. Comparison can be made of the auto trans Civic GLi sedan - which at 88kW has a little more power – that has a combined cycle average of 7.5 litres/100. So depending on how you look at it, the Hybrid can be said to have economy that is 30 per cent better than the standard Civic – or in the field of cars of around this size, have excellent economy... rather than exceptional economy. Certainly, its fuel consumption is light-years away from being as good as the Insight and is not as good as is achievable in the (more expensive but also faster) Prius. Away from the driveline, the rest of the car is competent without being outstanding. Apart from the rather hard seats, the interior is comfortable and attractive, with tasteful fake woodgrain splashed in small doses. 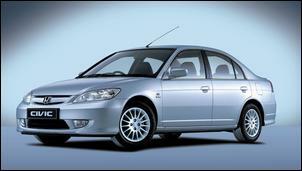 Front and side airbags are standard fitment and a single CD radio is provided. Because of the presence of the 28.6kg battery pack behind the rear seat, fold-down access to the boot is not available. However, at 268 litres, the boot is adequately sized. The climate control comprises a non-digital rotary dial system and unlike the Prius, the air-con compressor stops working whenever the engine has been automatically switched off. The on-road driving experience is let down by a poorly sorted ride. Despite the relatively high profile 185/70 tyres, impact harshness can be high and on some surfaces, the Civic develops an unpleasant bobbing motion. The rear end can at times be felt to jump sideways – a disconcerting trait and one that, oddly enough, doesn’t occur when the car is actually being cornered hard. Handling is competent when the car is pushed, with some throttle-lift oversteer available. No traction control or stability control systems are fitted and the rear brakes are down-spec drums. Dare we say it – with the Civic Hybrid, Honda has gone too far the other way from the Insight. The Civic’s hybrid driveline works very well, providing low emissions (the Hybrid Civic is an official Ultra Low Emissions Vehicle), very good fuel economy and quite adequate power and response. In fact, it’s the perfect hybrid car for someone who wants to go about their tasks unnoticed – and with driving behaviour very similar to a conventional car. The Honda Civic Hybrid was provided for this test by Honda Australia.